When purchasing any homebrewing equipment, it is important to purchase quality products that are made from quality materials. This way, your product will actually taste the way you want it to. Whether you are into beer brewing systems (or winemaking), it is important to know what the leading products are. From plastic fermenters to stainless steel and glass variants — we’ve got them here for you. Otherwise, your homebrew might be negatively affected just because you wanted to save a couple of bucks. If you’re new to the homebrewing world and aren’t too sure what brewers and tools to shop for, then you are definitely are not alone. 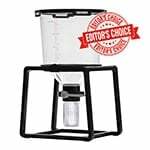 To help you out in making a decision, I’ve assembled a list of the best conical fermenters out there for your homebrewing needs. I’ve decided to include at least one of each type of conical fermenter so that way, no matter your budget, you’ll still be able to find the right brewing equipment that will get the job done. 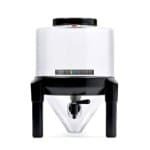 Craft-A-Brew’s The Catalyst Fermentation System has certainly changed the game for home brewers everywhere and is, in our professional opinion, one of the best conical fermenters currently in the market. It has a squat 6.5-gallon tank that looks professional, and incredibly sturdy stand made with I-beam and honeycomb construction, and has a 3″ Trub Trap Butterfly Valve that separates sediment, eliminates transfers, and allows you to bottle straight from it, making it a very fast fermenter indeed. It’s like what they say: Once you choose conical fermenters, you never go back. The Trub Traps can work with any large-mouthed mason jar, making it super simple to separate sediments or catch and store viable yeasts. The Catalyst’s tank is made from food-safe, BPA-free polymer, which is perfect for the storage of alcohol and other ingredients like grain, liquid malt extract, dry malt extract, and yeast. 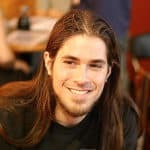 I highly recommend The Catalyst, whether you’re a beginner or an advanced brewer. If you do pick it up, make sure to pick up the tank cover to block out UV light and ensure your beer is protected. The FastFerment conical fermenter is an amazing option for anyone who wants to easily brew small batches of beer, hops, and kegs. It only comes in one size, which makes shopping easier because you won’t have to choose between a lot of different sizes anymore. This 7.9-gallon conical fermenter can take care of every single stage of the fermenting process–that means no transferring, no siphoning, no secondary sanitization, no extra accessories kits, etc. Extract beer from this fermenter right to your beer bottles without any sweat at all! 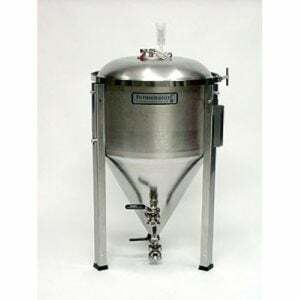 The FastFerment conical fermenter also contains a nifty detachable collection ball valve that collects the all-grain yeast (or beer yeast) and debris during the beer brewing process, which completely eliminates the need to transfer to a second vessel and makes cleanup easier. Don’t forget to always monitor the fermentation temperature to get a better brew. To control the temperature of your brew, we also recommend you getting the cooler bag. If you’re on a budget and can’t quite justify buying the stainless models, this 7.9-gallon conical fermenter is a good alternative. The SS BrewTech Brew Bucket is one of the best conical fermenters that money can buy. Like Blichmann’s Fermenator, it also has a stainless steel conical-shaped design, which makes fermenting with this equipment a quick and easy task. 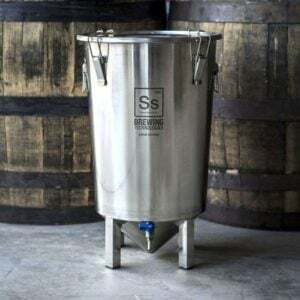 Although there are similar beer fermenters out there to the SS BrewTech tank, the alternate one only comes in a 7-gallon steel conical fermenter model, which is why this is a better choice for your home beer brewing process and kegging systems. The entirety of its body tank and components are made of food-grade stainless steel, and the pro tank includes a sealable lid which also has a hole for a blow-off ball valve and/or tubing. It also has stainless steel retractable food-grade handles that can be used to move the fermenter when it is full of beer. A quick tip: Don’t forget to monitor the fermentation temperature by doing a cooling temperature control for a better brew. The BrewDemon Conical Fermenter is a nice little beer brewing system that’s a good bang for your buck if you’re a home brewing enthusiast who’s not looking to brew a large batch of beer anytime soon. Touted as the world’s first small batch conical fermenting system, the BrewDemon will allow you to brew 2 to 2.5 gallons of beer, hard cider, wine and mead–just enough for you and your closest buddies. Its conical design allows you to easily transfer your beer into bottles without spilling it, while making sure that the trub (beer yeast, malt extract, hops, and other beer sediments) stays securely at the bottom. It doesn’t require an airlock but it includes a CO2 venting system, adjustable flow spigot and stick-on temperature gauge. This conical fermenter is made of food-grade PVC plastic that’s both heat-tolerant and phthalate- and BPA-free, so you won’t have to worry about your brew taking on flavors that are different from the flavors you intended. All in all, this is another good choice for brewing all your craft beer recipes right in the comfort of your home. 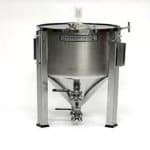 We’re always striving to find the best and newest beer brewing equipment for you, and that’s why we want to recommend another one–The Blichmann Fermenator. 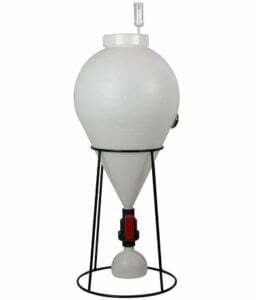 This fermenter comes with a hose and a valve and is one of the most popular and coveted conical fermenters out there in the market. This beast of a fermenter is made from solid stainless steel and contains pretty much every feature you would want in this kind of equipment. It also comes in a variety of sizes to suit your needs–from a small, 7-gallon unit all the way up to a humongous 42-gallon unit. 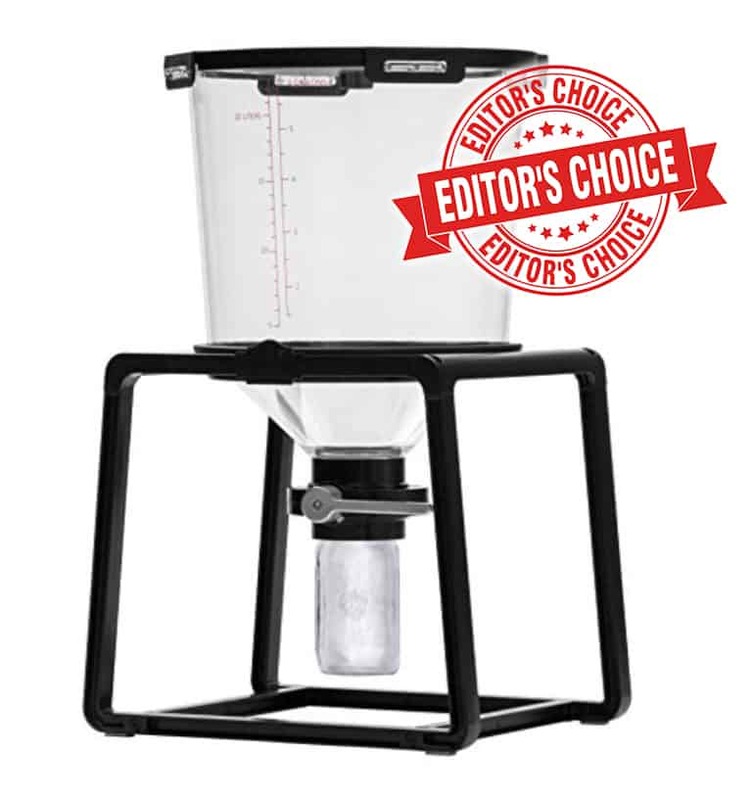 Its size is an obvious advantage over the carboy and the FastFerment, both of which come only in smaller sizes. If you want to go for a bigger conical fermenter I highly suggest you go with this one because it definitely is one of the best out there. These fermenters might not have a conical design, but we liked them so much that we can’t help but add them to this list. Maybe they’re not as fancy or as convenient as our recommendations above, but they have their own useful features that make them worth your hard-earned buck, and they can definitely do as good a job as any conical fermenter out there. 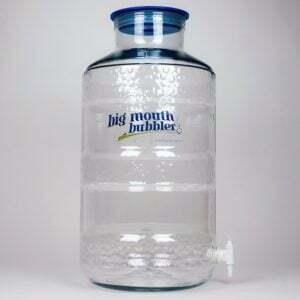 The Big Mouth Bubbler is very similar to a carboy that has extra features added to it. These features, in my opinion, are what makes the Bubbler worth splurging for, especially if you compare it with other standard beer brewing equipment. Big Mouth has designed their beer fermenters to incorporate a spigot at the bottom for a siphon-free design. This makes it extremely easy to attach a hose and transfer the wort to a secondary fermenter or bottling bucket before you tapping your wine, cider or beer into bottles. It also has a dual port lid that opens up a lot of other possibilities for your home brewing needs. The Big Mouth Bubbler comes in two different sizes: 5 gallons and 6.5 gallons. If you’re sold on the carboy-style models, then this fermenter is a nice step up and I highly suggest going with one of these. Now, let’s get that wort ready, shall we? 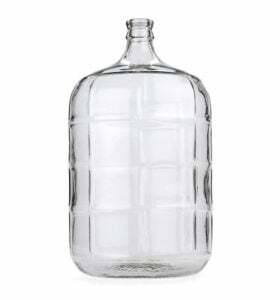 One of the most common beer brewing equipment out there is the carboy. This product looks like a large glass bottle and ranges in size from 5 gallons up to 15 gallons. 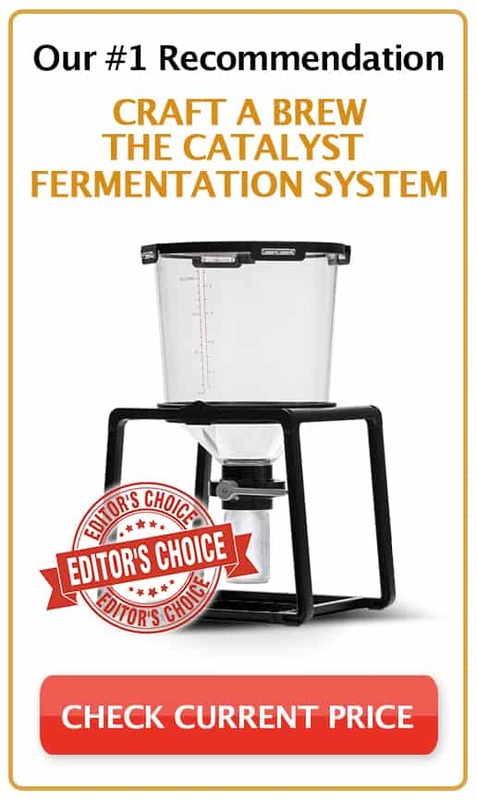 It is definitely one of the more inexpensive fermenter options out there, especially when compared to stainless steel fermenters that can cost quite a lot. I find this option to be much better than its plastic counterpart because it doesn’t hold odor or bacteria and it doesn’t scratch, discolor or break down over time. It also allows you to have a view of the ale, malt extract and beer yeast while they’re being fermented. I would suggest picking up a bubbler airlock if you decide to go with this product. Airlocks will allow the gasses to escape while still maintaining a tight air seal, and this will prevent contamination during the fermentation process. You may also want to pick up another one of these if you’re planning on having a secondary fermentation system. This fermenting bucket is one of the cheapest, if not the cheapest, way to ferment your beer. But please don’t set your expectations way too high. As you can see, it’s only a bucket! The product can also double as a bottling bucket (which is actually the more common of using it). From our point of view, if you plan to go this route, make sure to go with the siphonless model. Doing so will make the beer brewing process a whole lot easier for you, especially if you’re just starting out with home brewing. 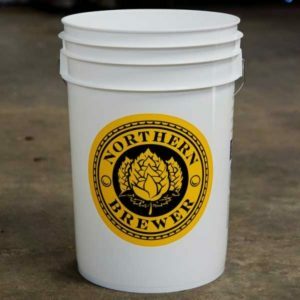 The Northern Brewer Fermenting Bucket also comes with the option to add a lid, an airlock (to keep the lid in place), a thermometer (to check the beer temperature) and a spigot–all for a very low price. Whenever I make a purchase, I always try to grab the best and the newest equipment that I can afford. That way, I won’t be forced to upgrade to something better a few weeks or months down the road. With that being said, I would recommend going with The Catalyst Fermentation System. It’s great whether you’re a beginner or an advanced brewer and is made from food-safe, BPA-free polymer, which is perfect for the storage of alcohol and other ingredients. I know this is a little more expensive than the other options I’ve talked about, but remember that you get what you pay for. Make sure to also pick up the tank cover to block out UV light and control its temperature.